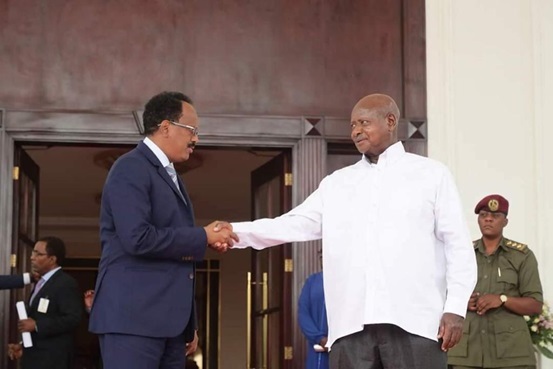 President Museveni of Uganda is well-known for speaking his mind and that is typically what he did when he recently referred to Somalia as a “failed State”. That has touched a raw nerve among Somalis still licking their wounds from the painful past and sparked predictably a nationwide outcry. Stepping into the row, Somalia’s underemployed and inexperienced foreign minister was quick to respond Somalia against perceived defamation from the very man that is protecting him and his government in Villa Somalia. In an interview, with the BBC Somali Service, he dismissed Museveni as more or less “talking hot air”, an undiplomatic language from the nation’s leading diplomat. For his part, Faisal Roble, the doyen of Wardheernews (whom I admire and respect-) reacted to this episode in a somewhat jingoistic manner. In an article posted in WDN, he declared that when it comes to choice, he would rather live in Somalia than in Museveni’s Uganda. And to justify that, he went to great lengths to paint a bleak picture of life in Uganda under Museveni in contrast to that in promising Somalia. But does that answer the substance of Museveni’s claim? In my view, all this knee-jerk reaction to Museveni’s remarks is missing the point. What he has done is to call a spade a spade that Somalia is a “failed State”. One can disagree or agree with this assertion and make the case for it. Is Somalia a “failed State” or not? That is the question to which we have to address ourselves. Many dispassionate Somalis will concur with Museveni. But many more are in denial of Somalia being the victim of national political failure. Instead, they would argue that it is a victim of a long catastrophic civil war and is now making steady progress to full recovery. In my view, this can only be the perspective of those who prefer to look at Somalia through rose-coloured glasses. This writer will defend Museveni as saying the truth about the state of Somalia. He is not the first to say it but merely repeating what the rest of the international community has been saying for decades about our country since the collapse of the Somali State in 1991. By definition, a failed State is a non-functioning one that is unable despite sustained international support to control its territory, population and borders and above all fails to provide its citizens their fundamental needs and rights such as right to life, property, health, education, among others. Isn’t that the case of Somalia? The evidence is everywhere and so glaring. Those in denial explain Somalia persistent deficiencies as rooted in to the “civil war” following the collapse of the State but that progress to full recovery is inexorably being made on all fronts. So, the scapegoat has to be the “civil war” after nearly quarter of a century when this so-called “civil war” ended. One has to from the outset challenge this concocted “civil war” red herring. What normally gives rise to a civil war that engulfs a country could be attributed to irreconcilable divide among its people along ideological, religious, ethnical, class, lines. What happened in Somalia is none of this. One has to remember that the people of Mogadishu, hailing from different clans from across the country, have always lived together in peace in the capital and the regions apart from the occasional clashes over scarce resources. It was therefore former allied warlords who, in their pursuit to topple Siyad Barre and grab power, first targeted what they deemed enemy clans, and later, after Siyad Barre was toppled, turned on each other fighting over the spoils, pitting one sub-clan against another that were hitherto at peace. Once the warlord tug-of-war for power ended, peace among the people returned in no time. The warlord upheaval was relatively short-lived and left no enduring divides among clans and regions. If anything, it hastened integration between northern and southern Somalia. From Borama, Hargeisa, Lascanood, Bosaso and Garawe in the north, to all the way Mogadishu and the rest of southern Somalia, Somalis could travel in both directions and live peacefully anywhere they want. Today one would find more southerners inhabiting in the north than at any time in the past and welcome at that. Be that as it may, there is no denying the havoc and immense damage that the warlords (and later Ethiopia) inflicted on southern Somalia, whose epicentre was Mogadishu. But as Faisal rightly points out, Somalis fell back on their historical resilience, shaped by their harsh environment, to pull themselves by their bootstraps and build their destroyed towns. And so Hargeisa and Mogadishu, both destroyed by different hands beyond recognition, soon rose like a phoenix from the ashes. But whereas we can rightly be proud of our resilience and resourcefulness at the personal level at home, Somalia as a nation otherwise remains mired in a quagmire at the centre. And it is not for lack of external support. After nearly 30 years of support of all kinds from the international community, successive governments of all stripes have failed to exert their writ beyond the environs of Villa Somalia. No better example can depict this failed State than its inability to uphold property rights. As it is, citizens are still unable after all these years to repossess their looted or illegally occupied properties, some located within sight of Villa Somalia. No less symptomatic of Somalia’s failed state is the demise of its sovereignty. Examples abound. Some countries do as they wish in Somalia in total disregard for the country’s claim to sovereignty. That is the case when some countries in the region or outside launch land or air military operations at targets inside Somalia often hitting civilian targets. Or the case of Kenya’s provocative mantra that their forces will remain in Somalia as long as it wishes for security needs. Or the case of the UAE announcement this week that it will upgrade its “military base” at Berbera in northern Somalia. The list goes on and Somalia looks the other way, often without a protest, perhaps hamstrung by its impotence as a failed State. The relative successful functioning of two regional polities, namely Puntland and Somaliland, in contrast to the failed State of Somali of which they are part, is instructive. Without judging the rights or wrongs for their establishments, what makes each of these regional entities function are the prerequisites of a population that is largely behind them, a political class that is dedicated to their mission, and an active civil society that unfailingly sustains them. And it is these pillars that defend and sustain them even when they are under corrupt leaders. In contrast, it is the conspicuous absence of these pillars that keep Somalia stuck in its quagmire. Faisal is sanguine about the future of Somalia which he predicates on what he sees as the budding democracy and the sprouting political parties which is to lead to one man one vote in the 2020 election. What credibility will these voter-buying have when the same deep-pocketed, corrupt clique, who include leaders who milked the country dry before leaving office, or those who sold out the country’s territorial waters, and others supported by foreign interests, are all bound to be returned and most likely grab the top posts?. Elections in 2020 will most likely be a replay of the 1969 sham election in which 64 parties contested, mostly formed just before the election. The only difference is that at that time the military intervened. This time, there is no prospect of that happening nor an uprising from an apathetic public. That could mean, God forbid, that the status quo, the failed State, is here to stay. I hope I am wrong and Faisal is right. Osman Hassan is a seasoned journalist and a former UN staff member. Mr Hassan is also a regular contributor to WardheerNews.